If you need a mobile overpack drum, this is what you're looking for. If you need a mobile overpack drum, ENPAC's Wheeled Poly-Overpack Salvage Drum is the first mobile one-piece unit of its kind. Built-in wheels eliminate the need for a dolly to transport these 95 or 65 gallon polyethylene UN-rated Salvage Drums. No dolly required. Wheeled Drum is easy to steer around any obstacle and through doorways due to the built-in handles and 6"polyolefin wheels. 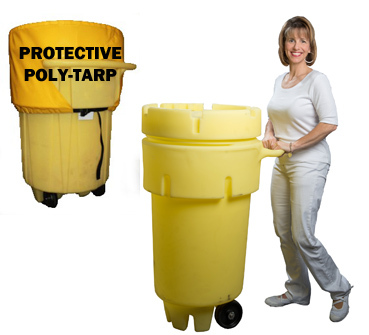 Ideal container for large, mobile spill kits. Top Diameter 31.38" 27.25" 23" 20"
Bottom Diameter 25.75" 24.75" 18.38" 17.75"
Height 47.5" 38.5" 45.38" 36"
These drums are oversized and must ship with an LTL freight company. All freight quotes are estimates only and do not include fuel surcharges that may change daily. Actual rates may vary. IT IS THE SHIPPER'S RESPONSIBILITY PER FEDERAL AND INTERNATIONAL REGULATIONS TO PACKAGE AND SHIP THIS PRODUCT IN ACCORDANCE WITH THESE INSTRUCTIONS. Contact ENPAC prior to shipping with questions regarding closure, packaging or use of this product. 1) Do not fill 50, 65, 95, or 110-gallon containers above the bottom of the thread. Do not fill 20, or 30-gallon containers above top of the drum. 2) Do not place materials into POLY-OVERPACK® and WHEELED POLY-OVERPACK® Salvage Drums which are incompatible. Contact ENPAC or your distributor for a Chemical Compatibility Guide. User responsible for chemical compatibility. 3) Gross package weight of the POLY-OVERPACK® and WHEELED POLY-OVERPACK® Salvage Drums and lids are not to exceed weight capacity. 4) No free liquids are to be transported. These drums have been qualified in accordance with 49CFR173.3(c) to ship solids. 5) Not approved for air transportation. 6) This is a single-trip packaging only. Do not reuse drums. 7) DO NOT stack drums once prepared for transport. 1) Place contents into drum. Make sure top sealing edge of drum is free from debris, cuts or gouges. NOTE: The lid gasket has been pre-lubed with silicone during manufacture. If desired, additional silicone spray may be applied prior to closing to aid the closure process. 2) Place lid on drum and twist the lid in a counter-clockwise direction until the lid drops onto the drum. Next, twist the lid in a clockwise direction until the lid is tightened. Apply additional torque to continue twisting the lid until the ARROW on the side of the lid matches up with the "ALIGN" bar or text on the side of the drum. If the ARROW will not match up with some portion of "ALIGN" bar or text, do not ship. The closure process may be performed by hand or with the use of a substrate, such as a 2" x 4". The substrate should be placed between the slots on the lid to allow proper torque to tighten the ARROW to the "ALIGN" bar or text. On Model No. 1295 -YE there are also openings that go thru the base at 90 degree angles to each other that will also accept a 2" x 4" board or substrate that can be used to stabilize the drum safely while securing the lid as mentioned above. The "board" can be wedged against a fixed object or secured downward to limit drum movement and reduce the number of workers required to properly close the drum before shipping. 3) It may be necessary, on some models, to "snug" the lid before shipment if the unit has been closed and has sat awaiting disposal. This may move the ARROW past the "ALIGN" bar or text. DO NOT EXCEED LIMITATIONS. DO NOT USE IF THE CLOSURE INSTRUCTIONS CANNOT BE PROPERLY PERFORMED.